Dr. Ruchi Mandaviya Doshi has completed her BDS, MDS – Orthodontics & Dentofacial Orthopadics from D. Y. Patil Dental College (Navi Mumbai). She has a clinical experience of over 7 years in examining, diagnosing and mouth problems. She has undergone extensive training in laser dentistry of applies the same in her day to day orthodontic and esthetic dental practise. She has been acitve in the field of cosmetic dentistry and has various part time certifications in the same. 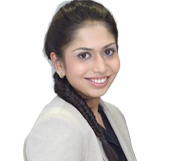 She is a member of Indian Orthodontic Society and has a certification in INCOGNITO (USA) Ligual Orthodontic System. Dr. Ruchi practices various systems of orthodontic appliances – labial orthodontics, ligual orthodontics, jaw growth modification, orthognathic surgical cases and clear aligners. She is a one stop solution for smile designing as well as orthodontics.